New Year, New Garden, Same Passive Aggressive Lesson in Manners. Some of you remember my post about Manners in the Garden. Last summer we had a few issues with kids not respecting the growing plants… stepping on seedlings, playing football too close to the bed… typical kid stuff, all *mostly* accidents. Well, this year I planted my garden in the backyard of the library again. Wasn’t it Van Gogh who said the definition of insanity was doing the same thing over and over and expecting different results? Am I insane? Did I expect different results? Who can say? This is a young garden. The plants are still getting acquainted with the ground. They are still adolescent plant babies and I am obsessed with checking on them constantly. Another difference with this year is that I no longer work at the library, and therefore can no longer log garden time as work. BUT, my BFF Izzy (my 10 year-old pal/sister from my library days) is sharing the garden with me. Basically agreeing to help me water and weed it, in exchange for taking veggies and flowers home for her family all summer long. Also it’s an excuse to hang out more, which is dope. I love Izz. But Izzy and I went out to check on the garden yesterday, and to our HORROR our beloved dill and young tomatoes were victim to RECKLESS BACKYARD ROUGH HOUSING. We were appalled. Izzy ran into the makerspace and started frantically pulling materials off of the shelves muttering something about “showing them what we’re made of” and “protecting the children”. I have never been more proud. 20 minutes later, we were sitting on the floor surrounded by cut up lengths of canvas and multi-colored sharpies, and determined to make our voices, and those of the plants, heard. We created a slew of signs, ranging from peaceful “Respect the Garden” to more graphic “Don’t kill us like our ancestors”. Izzy really showed me what she was made of, as if I didn’t know who I was dealing with… (a sass queen). At the end of our impromptu maker sesh, I was left with all of these random pieces of canvas, and no real idea of how I was going to display them in my backyard raised bed. Enter stage left, the true hero of the story, MY SEWING MACHINE. In my opinion, there’s nothing some bright yellow thread, hand-dyed yarn, and a solid zig zag stitch can’t do. I got home from work today and strung these signs together faster than I could spell “ancestors”. My sewing machine is such a beloved tool that I feel like I never get to use, and it brings me such joy to see her humming along, especially when she’s helping me create this fun and random project. With some help from a teen library patron and a few close encounters with a hammer (and some duct tape), I successfully strung up the cutest little garden signs you ever did see, and I am SO PLEASED with how they look. Here are some close-ups of the actual signs. They are gold. Anyway. Another exciting day in the life of Nora, the eternal Maker Educator. Thanks for reading, if anyone’s reading. 🙂 Send good vibes to my bb plants! I’m not much of a poet, but I love getting the chance to work with other creative ladies, and April was all about poetry… and with local poet, it’s also about pizza. 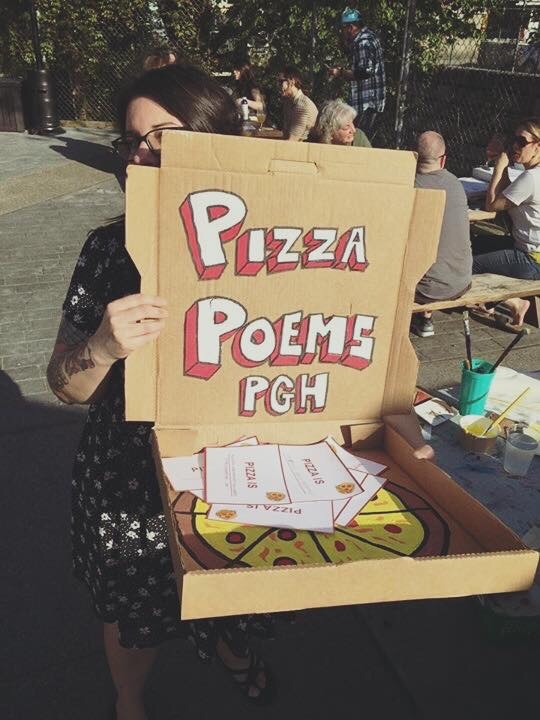 This was the second year of Steph’s annual project, Pizza Poems PGH. 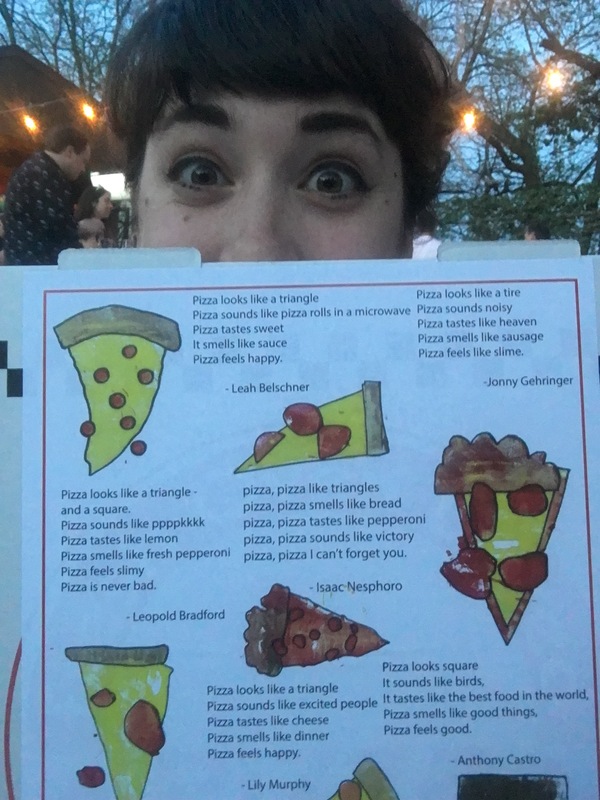 Last year she worked with her students at Brashear High School to write poetry and make illustrations inspired by pizza. 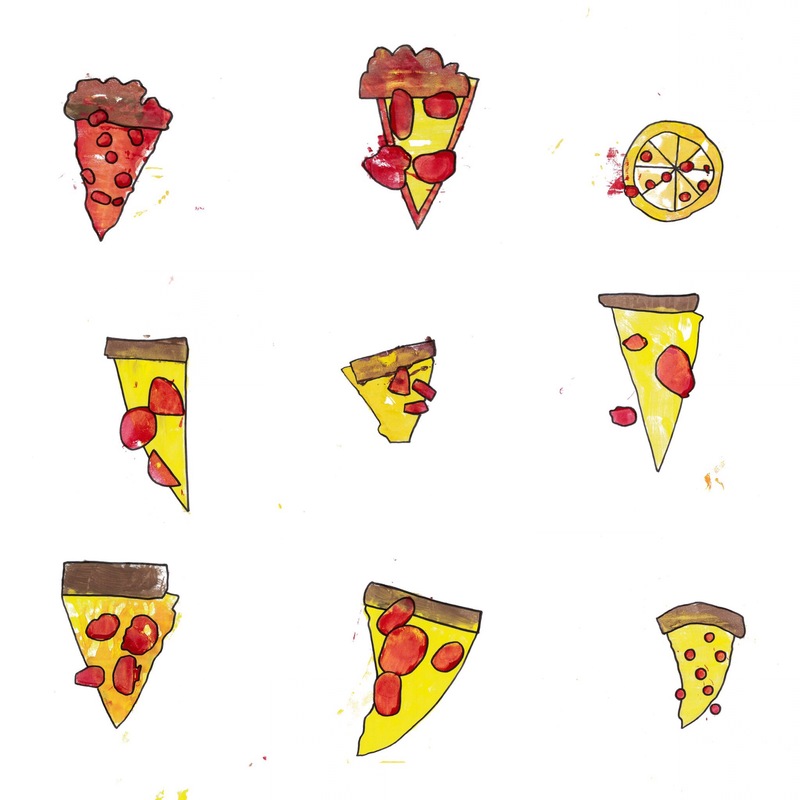 A few weeks ago we set aside an afternoon to make pizza stamps, write poetry about pizza, and of course, eat pizza. 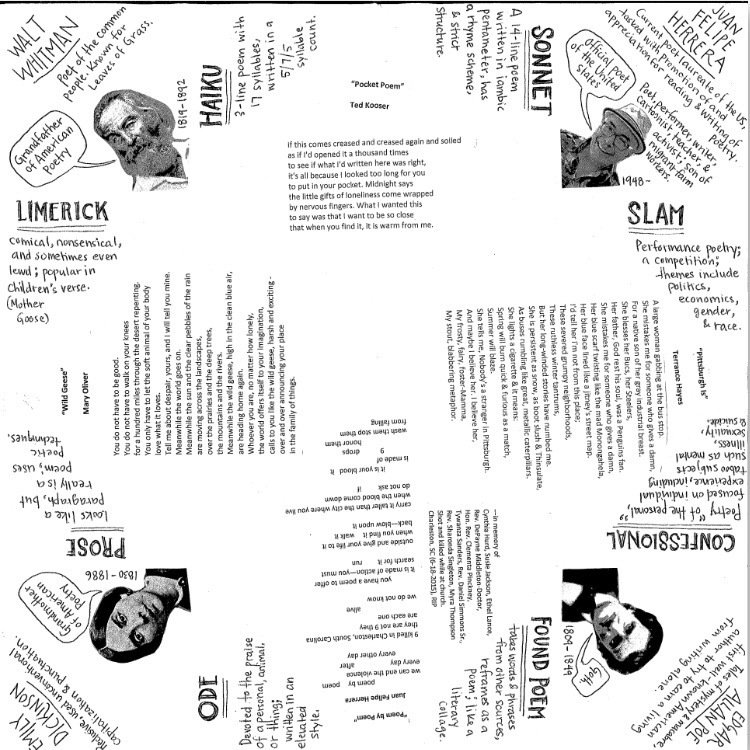 It took a little coercing to get the kids interested in poetry, but the results were really awesome. 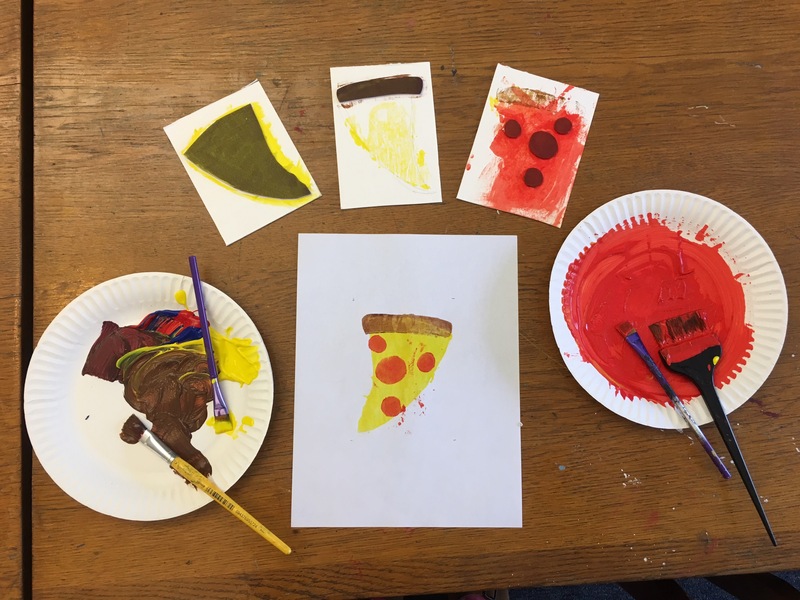 I had the kids make the stamps with craft foam hot glued to pieces of cardboard and foam core… Pizza was the perfect inspiration to get them thinking about printmaking in layers. Sauce, cheese, crust, toppings… easy ways to think about building up layers of color, and flavor! Last week was the event, we partnered with a local food truck, Driftwood Oven. Their pizza is seriously my weakness. We set up a table next to the food tent and as people enjoyed their pies and beer, Steph and I encouraged them to make some printed pizza patches and contribute to a collaborative poem. It was a pretty great evening. The following day just happened to be Poem in Your Pocket Day, a national initiative where everyone is encouraged to keep a poem in their pocket to read or distribute. Another fab collaboration came about as a result of Steph’s shower realization from the week before. “What if we made poetry fortune tellers!” So, that’s exactly what we did! Steph picked the poets and poems to be featured in the cootie catcher, and I designed the actual artifact. I made about 100 copies and spent a chunk of time folding them… my 5th grade self was giddy at the thought of folding fortune tellers at work. Available at the front desk of the library and the neighboring tea shop, our funky take on Poem in Your Pocket went home with a bunch of excited poetry-lovers. The PDF is available here for anyone who wants to print one and make it themselves! One of the projects I’m currently working on is a mosaic to for the roof of the Millvale Community Center. There was recently a solar panel installation up there, adding another building to the list of solar powered businesses in town. Teens from the library got to learn about solar energy and help in the installation, and I’m working on a piece of community art that will sit up there with the panels, drawing attention to how amazing solar energy is! 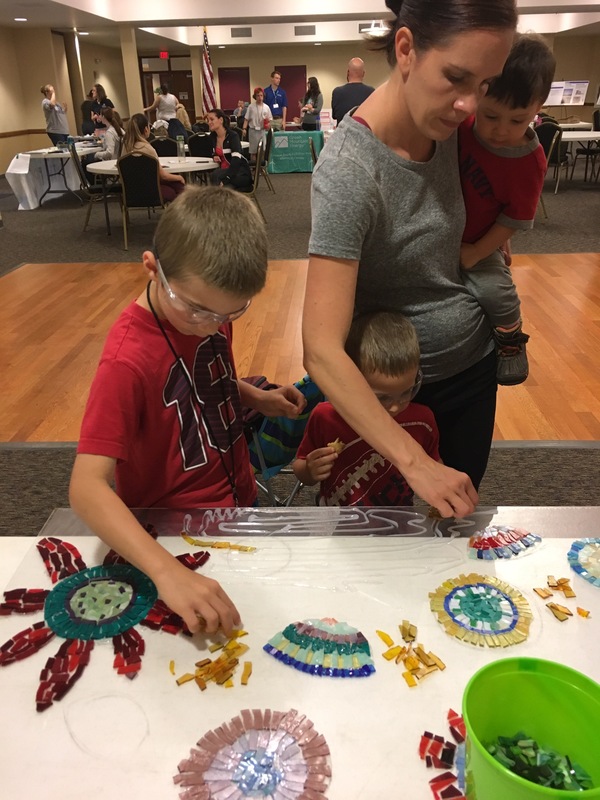 Today was the Millvale Environment and Health Fair at the Community Center. There were tables set up offering everything from a blood pressure test to free toothbrushes and water bottles. It was a really great to see the community supporting each other in such small ways. I had the mosaic, still in it’s early stages, set up at a table inviting people to come and work on it with me for a few moments. I had my trusty sidekick, Izzy, and a few other kids from the library stopped by to help. I love the opportunities for collaboration created in community art work. 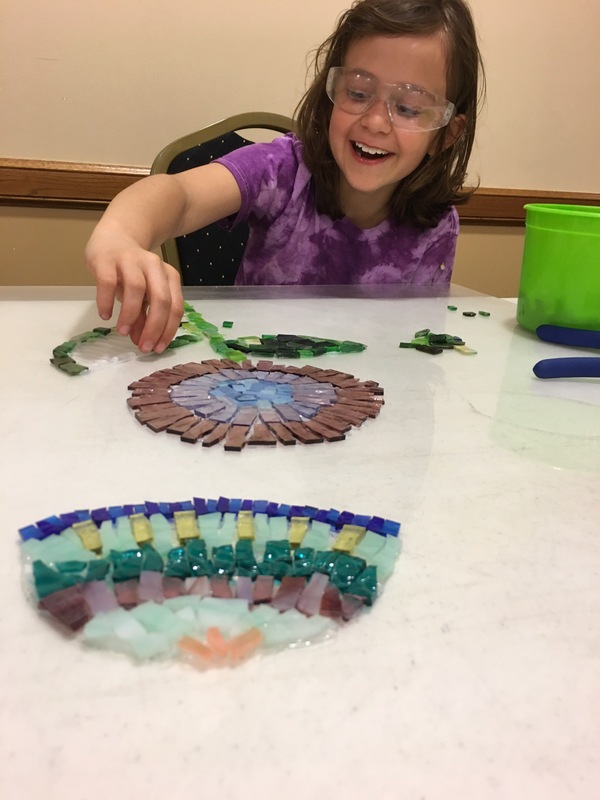 It’s so exciting to see all different types of people, kids and adults alike, working toward a common goal, even if it just requires stopping for a few seconds to place a few glass pieces. The mosaic is drying tonight, letting kids loose with a caulk gun means that there’s some serious goopage… but I can’t wait to continue working on it next week and seeing how it changes from here!